Introduction: Calciphylaxis is a rare medical condition that is usually diagnosed in patients suffering from end-stage renal disease who are already receiving renal replacement therapy and in those post-transplantation. The pathogenesis still remains to be fully elucidated; hence, the treatment is not uniform. The prognosis is generally poor. The ulcerative stage exhibits a worse prognosis than the nonulcerative one. Calciphylaxis presenting in terminal kidney disease prior to dialytic treatment has only rarely been reported. Case presentation: A 32-year-old female Caucasian clerk sought medical attention for increasing tiredness and lower limb skin ulcers. Polycystic kidney disease was diagnosed in her late father and two of her siblings. At the first nephrology consultation, obesity, pallor, bilateral flank masses with ballottement, and two ulcers with a dark necrotic center on the distal left leg were noted. 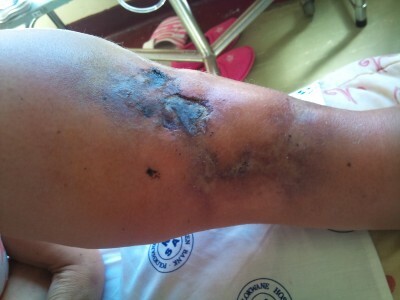 In addition, another indurated light bluish lesion of 5 cm just above the right knee with intact skin was observed. All lesions were very tender and warm on touch. Laboratory results yielded hypercalcemia, hyperphosphatemia, anemia, and parathyroid hormone levels that were more than ten times the normal values in the patient, and with a glomerular filtration rate of 4 mL/minute. Skin biopsy confirmed the suspicion of calciphylaxis. The patient was placed on peritoneal dialysis with low Ca concentration baths, cinacalcet, and aluminum hydroxide. The results included correction of hypercalcemia, improvement of phosphate levels, and the product of both Ca and phosphate, but only a transitory decrease in serum parathyroid hormone levels. The ulcerations were completely healed after 2 months of treatment. Cinacalcet was discontinued after 18 months, but multiple large-size, nonulcerative indurated areas appeared 3 months later in the lower limbs after discontinuation of the drug. A parathyroidectomy performed 17 months later revealed a four-gland hyperplastic disease. The patient experienced relief of skin symptoms soon after the procedure and remains in a very satisfactory condition. Conclusion: Calciphylaxis is a very complex clinical entity. Calciphylaxis presenting prior to dialytic treatment in end-stage renal disease is rare in the absence of a trigger. Cinacalcet and parathyroidectomy should be considered in selected patients.